Vittorio Emanuele I di Savoia, Re di Sardegna was born on 24 July 1759 at Turin, ItalyG. 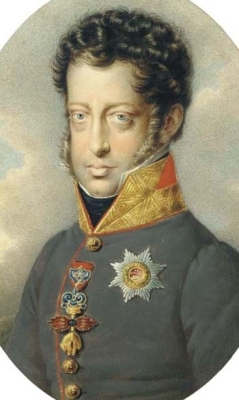 He was the son of Vittorio Amadeo III di Savoia, Re di Sardegna and Maria Antonietta Ferdinanda de Borbón, Infanta de España.2 He married Maria Theresia Erzherzogin von Österreich-Este, daughter of Ferdinand Karl Erzherzog von Österreich and Maria Beatrice d'Este, Duchessa di Modena, on 21 April 1789 at Turin, ItalyG. He died on 10 January 1824 at age 64. He was given the name of Albrecht Casimir August Ignaz Pius Franz Xaver at birth.3 He held the office of Joint Viceroy of Hungary.3 He gained the title of Herzog von Sachsen-Teschen in 1766.1 He held the office of Joint Stadtholder of the Netherlands between 1781 and 1793. Maria Elisabeth di Savoia-Carignano, Principessa di Carignano was born on 13 April 1800 at Paris, FranceG. She was the daughter of Carlo Emanuele Ferdinand di Savoia-Carignano, Principe di Carignano and Marie Christine Herzogin von Kurland.1,2 She married Rainer Joseph Johann Erzherzog von Österreich, son of Leopold II von Österreich, Holy Roman Emperor and Maria Luisa de Borbón, Infanta de España, on 28 May 1820 at Prague, Czech RepublicG.3 She died on 25 December 1856 at age 56 at Bolzano, ItalyG. She gained the title of Principessa Elisabeth di Carignano. [S16] Louda and MacLagan, Lines of Succession, table 122. 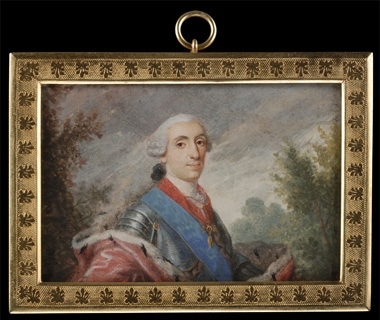 Vittorio Amadeo II di Savoia-Carignano, Principe di Carignano was born on 31 October 1743. 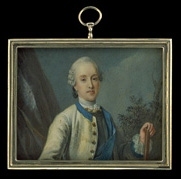 He was the son of Luigi Vittorio di Savoia-Carignano, Principe di Carignano.1 He married Josepha de Lorraine-Brionne, daughter of Louis III de Lorraine-Brionne, Duc de Lorraine-Brionne and Louise de Rohan, in 1768.2 He died on 20 September 1780 at age 36. [S16] Jirí Louda and Michael MacLagan, Lines of Succession: Heraldry of the Royal Families of Europe, 2nd edition (London, U.K.: Little, Brown and Company, 1999), table 120. Hereinafter cited as Lines of Succession. [S16] Louda and MacLagan, Lines of Succession, table 123. [S1744] Centro de Genealogica dela UNAM, "re: Ludwig Joseph Habsburg-Lorraine," e-mail message to Darryl Roger Lundy, 25 May 2006. Hereinafter cited as "re: Ludwig Joseph Habsburg-Lorraine."